To answer a hundred questions: No specific real people cameos in the crowds, and some of the ‘costumes’ I just kinda made up. This was at around 2pm on Thursday, I think. I don’t even know if registration was open yet at this point, or if people were just camping out to get their badge faster Black Friday style. I heard later they processed people super fast. I guess they did, cuz I never saw a line like that again. When I’d originally gone to Katsucon, it’d been a lot smaller and felt very comfortable. I’ve been to bigger cons and didn’t like them. I was a bit worried when I saw this, but despite the sheer size of Katsucon, I still felt really comfortable there, which is saying a lot. Also, I think we stopped counting the number of Deadpool cosplays we saw once we hit around 15. or Sailor Deadpool. Whichever came first. And I thought the last comic had a lot of effort and detail! Probably the most characters ever drawn in a Curtailed comic. I especially like the Deadpool one, the MLP backpack extra, the extra that fell asleep on the other guy’s shoulder, two people angrily playing Nintendo DS, and even Carmen Sandiego between the word balloon bridge. I bought my tickets at the show, and the pre-register line was actually longer. PS: I want to joke and say, is that horse character a horse person or was he wearing one of those Spencer’s Gifts horse masks? That sounds like a potential winner. ? 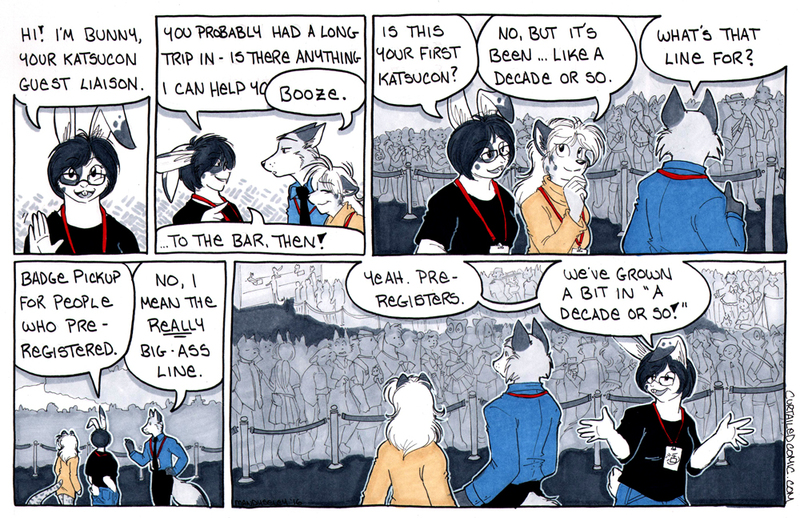 In the last panel, on the right hand side, I saw a character that, if you hadn’t said you didn’t done any real people cameos, I would have thought you took the character from Jay Naylor’s “Original Life”. I’m referring to the character that looks like he’s wearing ninja style outfit. I can’t remember the character to whom I’m referring. No, it wasn’t Thomas, although I’d love to see him in this comic. It was a character that dressed up like a ninja to protect the fat kid from bullies who wanted to steal his cupcakes. Ah, I’d have to go through the entire comic to find his name. Okay. I looked it up and I believe the character was Thomas’s next door neighbor, Charlie’s brother. He went by Justice Defender. It was a rather funny arc to me. Well, if I’m impressed with something, I can usually remember pretty minute details about it. Anyway, the character I was referring to looks like the Justice Defender from “Original Life”, except that he’s got that crossed bandolier look. Do you get hounded by people who want to poke their way into your comic? Only con i ever actually went to was Gencon, the last year it was in Milwaukee. everything was a blur but amazing nonetheless. Nope. Everyone was really cool. It wouldn’t matter, they’d have to be written into the comic. I think the only reason we are able to both hold full time jobs and do this is because we don’t actually write comics. We don’t create comedy consciously–it just happens. ive long wanted to do the same regarding my real life friends, online friends, and family. I swore that I would never go to a convention again. Now you want to make me relive that horror? Oh yeah, those background characters. Your patience and dedication is appreciated. I have a friend who is working on a comic in which she recently introduced an extremely hirsute character. After drawing the hair in his chest and arms in detail five times, she decided it was time to tweak the story and give him a shirt. Artists must have their limits, especially on projects that do not pay. Great work as usual – the background characters are all really well-done and everyone’s expressions are brilliant!